Please donate to WFM and help us reach our funding goals and carry on the work of LINC Myanmar! Without your support, we cannot complete these initiatives to the best extent! Every little bit counts for a lot! Interested in working with us? Come join our team or become our partner! LINC Myanmar is still an iHouse-recognized project. Waste-Free Myanmar started out of the project LINC Myanmar (www.lincmyanmar.webs.com) as a way to establish a continuous effort towards sustainability and the end of waste in Myanmar, a country that needs such initiatives more than other areas. By recruiting more people and establishments in this effort, both regional and global, Myanmar can become better connected to the world and the efficiency of sustainability initiatives increases in regards to scale and breadth of impact. The project started when MIT student Reese Caliman came to university after a trip to Myanmar in February 2013, where the country and its vices and virtues made a big impression on her. She founded this project in fall of 2013, with the support of iHouse, her living community at MIT devoted to international development (www.ihouse.mit.edu). The project's location is Kyaukme, Myanmar. 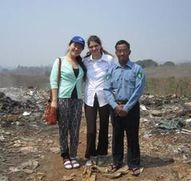 That same fall, Dou Dou became co-leader of the project and Reese and Dou Dou traveled to Myanmar during spring break in March 2014 to conduct a field assessment, with the goals of establishing community support and partnerships and gathering detailed information on waste practices and issues in order to formulate an informed and effective implementation strategy. Dou Dou and Reese continued working on the project in spring of 2014 with MIT's D-Lab Waste (International Development Lab on Waste) teacher Libby McDonald. In the summer of 2014, Dou Dou worked on her own project dealing with desertification in China, and could no longer serve as co-leader. In June 2014, Reese traveled with Alexander Jank to Myanmar to implement an awareness campaign on waste as well as a recycling collection system. Reese and Alex changed project focus when they met an influential townsman, Sai Than Maung, a generous and charitable man in a position of power as political leader of the White Tiger party and as owner of the Five Tiger Medicine company. The idea for a waste foundation came about by observing how an established institution that actively and continuously works on waste issues would bring a much more meaningful change to people's lives not only in the community of Kyaukme but in other areas of Myanmar as well. Reese began planning the organization in the summer of 2014 and is now in the process of setting up the foundation more concretely as of fall 2014. In January 2015, she will travel alone to Myanmar to establish partnerships with various groups to set up the multiple initiatives planned for the foundation. You can read more about Reese and the LINC Myanmar project's progress throughout 2013 and 2014 here.